No matter what country you visit there are always a few bad apples looking to take advantage of tourists and exploit their disorientation and unfamiliarity with their surroundings. Unfortunately this is also true in my beloved Buenos Aires. Personally I’ve not fallen victim to a tourist scam in Buenos Aires, and I’ve taken numerous trips, staying for months at a time. I don’t think the city is particularly “scam-ridden” and I don’t believe tourists are preyed upon nearly as much as in other destinations, such as Mexico for example. For the most part tourists are left in peace to enjoy the city. 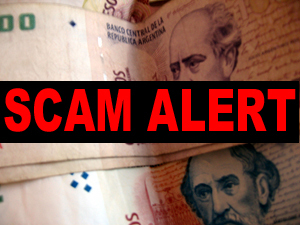 Below are the most common scams and rip-offs you need to be aware of when visiting Buenos Aires. These scams have either happened to friends of mine or have been widely reported on Buenos Aires message boards and websites. For a more thorough analysis of crime in Buenos Aires and how to avoid becoming a victim, see the article How Bad is Crime in Buenos Aires. In this scam the unwitting tourist is sprayed with mustard or some other messy substance resembling bird poop. The thieves, sometimes pretending to be fellow tourists, then offer to help the tourist clean up. In the process, the tourist is pickpocketed or robbed. To protect yourself, don’t let anyone help you clean up or let them lead you to a place where they say you can clean up. If they touch you or get too close, get angry and yell at them. When a tourist pays for a taxi with a large bill, usually 100 pesos, the driver switches the bill for a fake. He then shows the fake to the passenger and explains why it is no good. He demands payment with “real” bills. Sometimes the driver may ask to inspect your money before the trip, again so he can make the switch. This scam is particularly common at the Retiro train station and in front of restaurants in Puerto Madero. It happened to a friend of mine in Retiro. To protect yourself from this scam, always pay taxi drivers with small bills. Avoid taking taxis near the Retiro train station. Many other scams are less blatant but can still cost you money if you’re not alert. Some hotels quote their rate in US dollars but at check-out charge you in pesos at a ridiculous exchange rate. Also, some businesses may charge non-Spanish speakers more than they would charge locals for the same merchandise. Expats sometimes refer to this as the Stupidity Tax. Sometimes a taxi driver may pretend to forget to turn on the meter then charge you an inflated fare on arrival at your destination. One other taxi scam I’ve heard of, which I think is extremely uncommon, involves the taxi driver pretending that his car has broken down part way into the trip. He then offers to call you another taxi. The second taxi is operated by his accomplices who will rob you. One time my taxi broke down in a dicey part of La Boca and the driver said he would call another taxi. Sensing a scam, I declined and caught a taxi in the street. However, in retrospect, I think the taxi really did break down. The engine wasn’t running smoothly and many Buenos Aires taxis have been converted to use natural gas which can cause engine problems. Thieves have been using that bird poop scam all around the world for what seems like decades. It’s a classic. Another scam you missed is the dodgy taxi meter that suddenly runs on, I have had this happen to me and when I stated that I never pay more than $15ar for this trip he said it was tarife dos. The fare come to $35ar but I gave him only$20 as that was the smallest I had, he knew he was getting no more so accepted it. Another is the taxi taking a roundabout route, it really helps if you know your way around, and take a taxi on a street going in the right direction. As you said these things are rare, and I have even had one taxista turn his meter off when he took a wrong turn, but as always, it oays to be aware. Thanks for the tips, tangobob. I’ve actually had very good experiences with the taxis in BA. One time the driver forgot to turn on the meter. We both realized it once we reached my destination. I asked him how much I owed him and he sheepishly said “3 pesos?” I take that ride all the time and I know it costs 10 pesos so that is what I gave him. He was the exact opposite of a scammer. He was an honest guy willing to eat the cost of the fare for his own mistake. Not sure if this qualifies as a scam but people should be aware that the $ sign in front of prices means ARGENTINE PESOS, not US DOLLARS. So don’t get confused and pay three and a half times as much. We got the bird poop scam pulled on us today. We didn’t know what was happening but the whole thing stunk, in more ways than one. All we lost was a subte ticket out of my back pocket. They spent more on all the water and tissue they were giving us. Got the Pigeon Poop Scam pulled on me yesterday 24th of July 2010, they took two of my cards from my wallet and managed to return my wallet with the cash inside without me noticing, I didn’t realise until 2 hours later that i was missing these cards when i wanted to withdraw some cash. The couple that pulled the scam were in their 40’s with very friendly faces, they happened to be walking towards me when it happened so i had no reason to suspect anything, there has to be a ring with a 3rd person involved who does the squirting, when they try to help you, just say no thanks..
2 hours had elapsed before i noticed and during this time they managed to spend a total of £3000, most appear to be in the local high fashion designer shops in Santa Fe. I went to the police station on Suipacha 1156 to report the incident, they took it seriously and asked for a full list of the transactions made and retailer names and addresses. Interestingly they told me they’d never heard of this scam! 🙁 only wish i’d come across this web site before arriving here, other than that dont let my experience put you off, Buenos Aires is a fantastic city to visit and on the whole i found most people to be very friendly and warm. forgot to mention where, while sitting on a bench near Monumental Tower San Martin! Just got completey robbed in buenos aires, beware! I will try to keep it short. I am a 24 year old male from the UK. While walking to from the city centre to san telmo around 1pm a mid-thirties man approached me asking for directions to the markets. I said I am not sure but offer him my map. He seems really nice and said he is a tourist from madrid, he had a backpack etc and looked like a tourist. He didnt speak much english and I dont speak much spanish but we talked and ended up walking to the markets. I never suspected a thing. Then he told me the banks were shuting for a couple days for holiday and I should withdraw money. First clue. As I needed money anyway I withdrew around 1200 pesos as I was going to buy presents etc. I was thirsty and he suggested we have a beer as I had said I wanted to watch the end of a football game. After 2 beers and some food we were getting on well. He had many stories and I was happy to sit with him. This was in a very busy but small plaza. One of the last things I remember was my new beer tasting strange (we were sharing a litre with 2 glasses) and asking him if his was also. He said no it must be too warm. Then we left to look at the markets, as I stood up I felt a bit tipsy. I then woke up some hours later in a park with many people around, I was diroirentated and confused. I had no camera, money, or ipod. I asked 3 local people and their english was good, they describe the man I was with and said they thought he was my friend and I was very drunk. they saw him using my camera and sitting with me before heading off. The guy deserved an oscar. He had drugged me and robbed me. Well looks like we were caught by the same scam, well almost. I was approached in buenos aires by a guy cleaning to be from Venezuela. He initially asked me for directions and we got chatting after. After about an hour we decided to grab a bite to eat and shared s bottle of wine. I started to feel much more unsteady on my feet that I should after 2 glasses of wine and started to feel z bit suspicious. He them also pulled he lime that the banks are of stricken foe the next 6 days and that I should get money put. He even agent yo the extent of going inti 5 banks, but never withdrew n w money himself. The kicker was when that we got a number of soft drinks but he only bought 1 to share and subtly didn’t drink from it. The finalevwas that as we stopped 4 a coffe and he went to the bathroom I found an empty alprazolam packet on the floor. I left it on the table. I confronted him on it and he was very coy saying it was for his nerves. I told him what I though was going on, took a couple of pictures of himmand went to the police. Luckily as I woke in the police statsion completely disoriented and stabling around like a drunk man. That said I learnt my lesson by falling for then”leyden go have s drink scam in Istanbul. So I had a little heads upp. I thinkbtjis advice is very important for single travelers and sespecially guys!!! We’re currently in production on a series about scams that occur in cities around the globe for European television. We want to provide an informative travel show that emphasizes each city as a travel destination but at the same time aims to make tourists aware of popular scams like the ones mentioned here.